When you have an HSA you have to account for the contributions and distributions on your income taxes. With an HSA you need to make sure you don't put in too much or take out too much or you'll owe income tax and possibly penalties. The key things to account for with your HSA for tax purposes are the contributions to the HSA and the distributions. The contributions will tell the IRS how much of a deduction you get off your taxes and if you put in more than the maximum. The distributions tell the IRS how much was taken out and how much of that was for your out of pocket medical costs. If you did things correctly then your contributions will be under the maximum and your distributions will be no more than your out of pocket medical bills. If you took more in distributions than your out of pocket medical bills then you'll owe taxes and a 10% penalty, just like if you were to cash out a 401k prematurely. 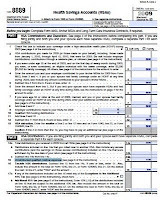 If you have an HSA then you must fill out form 8889 when filing your income taxes. Form 8889 has two main parts to be concerned with. Part I you document how much you put into the HSA which then gives the amount that is deducted from your taxable income. Part II accounts for how much money was taken out of the HSA and how much you spent on reimbursed qualified medical expenses. In this section you list all the money contributed to the HSA. You could have money contributed by yourself either directly or via a paycheck withdrawal. Your employer may also have contributed to your HSA with their money. Its also possible to fund an HSA via a one time rollover from an IRA or Roth IRA. 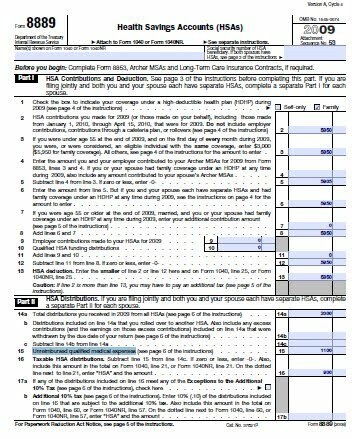 Line 2 of form 8889 is the amount you put into the HSA. Lines 9 & 10 are the amounts your employer put in and any amount from a qualified contribution from an IRA. The amounts for line 9 & 10 are not tax deductible. TO figure the amount you can deduct from taxes you subtract what your employer put in and any IRA contribution from the total amount. For example: You are single and your HSA was funded with $3000 total in the year. $500 of that came from your employer and $2500 was your own money. Line 2 you enter $3000, line 9 is $500 and line 13 ends up $2500 which is your HSA deduction or the amount that can be deducted from your taxes. Note that if you put more into the HSA than the maximums then you could owe taxes on it. In the section section of form 8889 you account for the money taken out of the HSA. Line 14 starts with the total amount taken out of the HSA. This includes rollovers, money spent to pay medical bills and any other money taken out for whatever reason. With line 14b you subtract any rollovers from your withdrawals which results in line 14c. Line 15 is the amount of qualified medical expenses you had which were not reimbursed by someone else. This means medical bills you paid out of pocket. If someone else paid the bill such as your insurance company then you can't count it here. If you subtract line 15 from the amount on line 14c then that is the amount taken out of your HSA that was not for a rollover and was not for a qualified medical expense you paid yourself. That total is in line 16 and is the amount taxable. This counts as taxable income that you owe income tax one. Also if its not a qualified distribution then you will also owe a 10% penalty tax which is figured on line 17b. Example: You had two doctor bills for the year that you paid 100% out of your HSA funds. You had a $200 bill and a $300 bill for $500 total. This is all the money you took out of the HSA. When you fill out part II you would list $500 on line 14 as the total distribution, $0 on line 14b since none of it was a rollover which gives you $500 on line 14c. Line 15 is your medical expenses of $500 total. These are qualified expenses because you used the money to pay for legitimate medical expenses. When you add it all up the value for line 16 comes out to $0 which is what you want since this means you don't owe any taxes or 10% penalty. The bank that handles your HSA will send a 1099-SA form to the IRS. This form tells the government how much money was distributed from the HSA and how much interest your HSA made. The gross distribution figure is the important one. This is the amount taken out of the HSA. The 1099-SA only gives a total dollar figure and does not say exactly why the money was taken out or even if it was actually for medical expenses. Another form is the 5498SA which tells the IRS how much money was put into the HSA and what the year end balance was in the account. The IRS has no information on exactly what you spent your HSA funds on or withdrew the money for. There is no reporting to the IRS by your doctors or health care professionals to tell them what your bills were. You are responsible for keeping records on the medical services you paid for out of pocket. You need to keep receipts and invoices to show the amounts you were billed and what you were obligated to pay yourself. Make sure to keep records of your qualified medical costs.